Thank goodness the Heat have won the championship. Now we can all get on with more important things, like Summer Theatre Fest, sponsored by WLRN and The South Florida Theatre League. And what better way to celebrate than with FREE theatre tickets. The South Florida Theatre League has built an entry for The Great Coconut Grove Bed Race. This week, the bed makes an appearance at a rehearsal for Spamalot at the Fort Lauderdale Children's Theatre on June 27. They are located in the Galleria Mall, so you can also sneak in some shopping, or grab a bite in the food court. And every Monday, Theatre League member theatres will be hosting readings of plays by playwrights who are League members. This coming Monday, Parade Productions presents The Gift at the Studio at Mizner Park. Red opens at Miami Theatre Center this weekend, through July 13. This is NOT the play you saw at GableStage or Jupiter Theatre, it just has the same title. It's a limited run through July 13. The Plaza Theatre presents 8-Track: the Sounds of the 70's; they finally have it up on their website, and with a little digging, we've been able to discover the secret ending date of July 7. Slow Burn Theatre offers its Summer show; The Wedding Singer, finishes its all-too-brief run on Sunday. 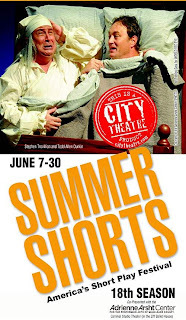 City Theatre's latest edition of Summer Shorts winds up its run at the Adrienne Arsht Center for the Performing Arts this Sunday, June 30. Brighton Beach Memoirs also wraps up at the Broward Stage Door Theater June 30. My Son The Waiter closes its extended run on June 30 at the Broward Stage Door Theater. Florida International University offers Bachelorette through June 29. The Curtain Call Playhouse presents Cinderella at the Township Center for Performing Arts in Coconut Creek this weekend only. Fantasy Theatre Factory presents Gordon Gumshoe: Fairytale Detective at the Fairchild Tropical Gardens in Miami. Slow Burn Theatre Company opened its production of The Wedding Singer on June 21, 2013. It’s 1985 and rock-star wannabe Robbie Hart is New Jersey’s favorite wedding singer. He’s the life of the party, until his own fiancée leaves him at the altar. Shot through the heart, Robbie makes every wedding as disastrous as his own. Enter Julia, a winsome waitress who wins his affection. Only trouble is Julia is about to be married to a Wall Street shark, and unless Robbie can pull off the performance of a decade, the girl of his dreams will be gone forever. With a brand new score that pays loving homage to the pop songs of the 1980′s, THE WEDDING SINGER takes us back to a time when hair was big, greed was good, collars were up, and a wedding singer might just be the coolest guy in the room. Patrick Fitzwater directed a cast that included Clay Cartland, Courtney Poston, Nicole Piro, Rick Hvizdak, Conor Walton, Domenic Servido, Penny Mandel, Erica Mendez. Rick Peña, Jerel Brown, Ben Solmor, Jonathan Yepez, Lauren Bell, Sabrina Gore, Kaitlyn O’Neill and Alisha Todd. What this silly smile of a show undeniably lacks in polish and consistency, its cast makes up for with grinning enthusiasm and goofball abandon under Patrick Fitzwater’s direction and choreography. As an entry in the romantic comedy genre, you might yearn for it to touch your heart a bit more, but it succeeds as a gentle hoot. Fitzwater knows the piece’s underlying virtue is that decent everyday people are pursuing dreams. They may be modest, simple dreams of love and success, but they are so universal that an audience is charmed by their purity. Fitzwater has a gift for casting and then leading that cast to solid work. His best call here was Cartland... He seems like the genial guy in the apartment down the hall, but he exudes the sense that whacked-out goofiness could erupt at any moment... He’s also blessed with a strong, warm and supple voice that doesn’t call attention to just how well he has mastered the material. Poston proved she has a terrific show voice as one of the twins in Side Show that. Here, she doesn’t score as strongly (well, the songs themselves don’t give her much to work with), but as the ‘80s version of the wounded wholesome girl next door she caresses her songs with such loving affection that she wins you over every time she walks on stage. The Wedding Singer is just a calorie-less glass of iced down Crystal Light, but sometimes that’s exactly what you need for a warm summer solstice night. 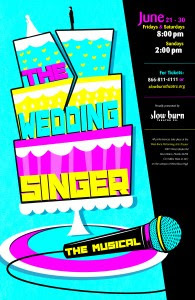 Slow Burn Theatre Company presents The Wedding Singer at the West Boca Performing Arts Theatre through June 30, 2013. Hello, everyone. I'm Andie Arthur, executive director of the South Florida Theatre League. It's time for Off Stage Conversations, where I take a look at what's happening in the national and international theatre communities. There are a lot of jobs where you have to get hired based on this version of who you think they want you to be. We just don’t have that. We don’t ever get anyone who’s a wild card in a bad way. We take gambles on people sometimes but we’re usually taking gambles on them artistically. Doing anything like what we do in front of an audience who may not get it doesn’t mean they are dumb, it just means they may not get us. The more people treat the audience as smart people who came by choice, the better off we all are. Holly Derr responds on the ethics of unpaid internships and touches a little on how classism effects our industry. Meanwhile, the Huntington Theatre made an announcement on their new community membership program, where those who qualify will be able to see all of their shows for $15. It reminds me of the much more open Radical Hospitality Program at Mixed Blood Theatre. It's exciting to see theatres deal with class issues in their audience development head on. Techniques for online fundraising. And why you need to pay attention to this section of the field. David Green talks about Immersive Theatre experiences for TCG. I feel that immersive theatre often gets slotted into the same role as audience participatory theatre, but they really are different experiences with different aims. I'm really excited about what I hear from Chicago and New York about new immersive theatre experiences (such as Sleep No More), and that's one of the areas of the field that really invigorates me artistically. This weekend City Theatre held their third annual CityWrights conference for playwrights. And in case you weren't able to attend, a lot of the sessions are available on HowlRoundTV. Stage Door Theatre opened its production of Neil Simon's Brighton Beach Memoirs on May 31, 2013. Dan Kelly directed a cast that included Josh Lerner, Alex Salup, Matthew Korinko, Merry Jo Cortada, Elizabeth Simmons, Mary Sansone, and Hannah Wiser. Director Dan Kelley has assembled a cast that serves Simon’s play well, with the actors mining just about all of the script’s humor, poignant moments and squabbling. Lerner, who will begin his junior year in high school at the end of the summer, is just the right age to play Eugene, but what makes his performance so winning are his eagerness, warmth and observant intelligence. Salup, a senior at Florida Atlantic University, conveys the myriad worries of a young man forced to play an adult role before he’s quite ready. Sansone is no petulant teen, but she plays one convincingly, and Wiser is a wise-beyond-her-years Laurie. Korinko’s Jack is a quintessential father figure, worn out yet genuine in his empathy for those he loves. Kate is the all-knowing Jewish mother, a tough woman who is sometimes anything but likeable, and Cortada fearlessly explores Kate’s extremes. Simmons’ Blanche persuasively comes into her own near the end of the play, but during the first act the actress plays her character as a colorless cipher. If a piece of theater yanks an emotional response from you, no matter how manipulated you’ve been, no matter how flawed the production is, it’s hypocritical not to admit you’ve been touched. So acknowledge that Broward Stage Door’s revival of Neil Simon’s thirty-year-old warhorse Brighton Beach Memories is uneven and stumbles. Then acknowledge, at least this critic will, that Stage Door’s edition frequently reaches into that moldy storehouse of decades-old memories of family relationships — and makes the throat close up, the eyes mist and starts a sudden epidemic of sniffling around the auditorium. ... don’t slight credit for director Dan Kelley and his cast, especially Merry Jo Cortada and Matthew Korinko as the parents. While much of the cast has trouble smoothly melding the comedy and the pathos that makes this such a tough but rewarding play, they deliver the two separate elements with skill, passion and a credible naturalism. The audible laughter and sniffles testify to their success. Kelley’s reputation is rooted in farce and musicals. But here he focuses on helping the cast excavate the genuine emotion. Their chemistry ebbs and flows, but you can’t argue with the palpable bond of love and pain that they create... Where Kelley has really succeeded is pacing: This show never drags; indeed, other than when it needs to slow for dramatic effect, the entire production glides assuredly at a brisk clip. Lerner has the requisite vitality and energy that bursts from his face like a carbon arc searchlight. His Eugene has that slightly off-kilter quality of a teenager who finds that his evolving adolescence and libido are keeping him both excited and off-balance. Lerner’s problem is that when the plot turns serious, he’s still pitching that grinning wiseacre persona when you’d expect Eugene to be a shade more chastened. Cortada... melts into the role of Kate. She perfectly embodies Kate’s steadiness as the beleaguered but loving rock of the family unit. Korinko... smoothly inhabits the warm and insightful patriarch hiding his panic and feeling of failure over the family’s crumbling finances. If his Jack doesn’t remind you of your own father, you’ll wish that was who your father had been. Shout outs are due Sean McClelland who created a convincing clapboard two-story home with period perfect wallpaper whose patterns gel with the modest flowered house dresses chosen by Larry Baumann. Praise is also due Ardean Landhuis who delivers some of the best lighting we’ve seen at a Stage Door show in some time. There’s a sun-dappled, almost idyllic feel to the opening scenes as light comes through unseen trees. 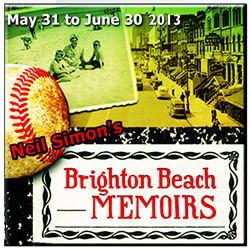 Brighton Beach Memoirs plays at the Broward Stage Door Theatre through June 30, 2013. .City Theatre opened the latest iteration of Summer Shorts at the Adrienne Arsht Center for the Performing Arts on June 7, 2013. This year's Summer Shorts includes iZombie by Kendra Blevins, The Gay Agenda by Paul Rudnick, Please Report Any Suspicious Behavior by Rick Park, Departure by Holly Hepp-Galvan, The Student by Matt Hoverman, Feel the Tango by Susie Westfall, Serendipity by Steve Yockey, The Favor by Leslie Ayvazian, Bite Me by Nina Mansfield, A Tall Order by Sheri Wilner, and Mothra vs The Casting Director: An Allegory by David Bar Katz. Artistic Director John Manzelli assembled a team of directors that included Margaret M. Ledford, Antonio Amadeo, and Mcley Lafrance. The cast included Irene Adjan, Ken Clement, Todd Allen Durkin, Rayner Garranchan, Renata Eastlick, and Vera Varlamov. The overall production is concept-driven, the idea dreamed up by artistic director John Manzelli and Antonio Amadeo, part of the directing team (Margaret M. Ledford and Mcley Lafrance are the others). Each play is treated as if it were a piece in an art gallery, represented by a painting or poster or photograph on set designer Jodi Dellaventura’s maze of white walls. Props and furniture get switched, but the over-all design is elegant and effective, with tall, fringed curtains absorbing the ever-changing colors of Melissa Santiago-Keenan’s lighting palette. Add Ellis Tillman’s imaginative costumes and Matt Corey’s artful sound design, and you have one of the more appealingly realized Shorts productions in many years. Six talented actors, with an assist from Shorts interns, deliver all that variety. Shorts veteran (and audience favorite) Stephen Trovillion isn’t part of the company this year, but that allows a different actor -- Magic City’s Todd Allen Durkin -- to shine. He’s in great company with Irene Adjan, Ken Clement, Renata Eastlick, Vera Varlamov and Rayner Garranchan, but the richness, variety and finesse Durkin brings to each character are fascinating to watch. Paul Rudnick’s stinging, riotously funny The Gay Agenda is a monologue superbly delivered by Adjan as a conservative Ohio housewife who swears she isn’t prejudiced then proceeds to disprove that notion with every word that comes out of her mouth. Rick Park’s quirky Please Report Any Suspicious Activity features Clement and Garranchan as subway-riding dolphins having a lovers’ quarrel, much to the priceless discomfort of a fellow passenger. Clement as a writing professor and Durkin as his endearingly oddball student have perfect chemistry and timing in Matt Hoverman’s The Student. Garranchan and Varlamov meet cute and grow cuter in Kendra Blevins’ iZombie, a funny meditation on just how tough it is to function without our omnipresent smart phones. The program’s seven other plays don’t rise to that level, though there are no out-and-out duds this year. Sometimes for actors, especially playing comedy, the only option is to jump off the cliff and see if you can fly. The miracle is that sometimes, as in City Theatre’s Summer Shorts, is that, indeed, they soar. See the demented look in Todd Allen Durkin’s eyes as a closeted refugee from Santa’s workshop seeking feedback from his writing teacher on his autobiographical homework assignment. Actually, just reread that sentence. Watch Renata Eastlick go increasingly bonkers as she quintuple-guesses how her options of choices of food at a restaurant might influence how her date might think of her. And without giving anything away, wait for the sight of Ken Clement leaning against the bars of a cage nonchalantly filing his nails. Trust us. This 18th edition of short new comedies performed by a repertory troupe scores as one of the series’ stronger entries in recent years. Certainly, some works are far stronger than others and, as always, most of them still need rewriting and tweaking. Consistency has never been a Shorts hallmark. But not a single sketch this year is a head-scratcher, a problem that has dogged the festival most seasons. Most are diverting, pleasant sources of chuckles and guffaws. Once again, City Theatre benefits from a cadre of skilled directors and actors with a feel for the daffy and droll groove. The cast roll includes Durkin; Eastlick who is moving to New York City; Clement; Shorts mainstay Irene Adjan; indie theater vet Rayner Garranchan and newcomer Vera Varmalov who starred in Mosaic’s The Birds. Take John Manzelli and Antonio Amadeo. Turn them loose with Irene Adjan, Ken Clement, Todd Allen Durkin, Renata Eastlick, Rayner Garranchan and Vera Varlamov in eleven short plays. Caution, you may hurt yourself laughing. Did you notice there were only six actors doing eleven plays? Of course you did. Well, let me add that no matter what the piece, this cast was simply terrific. You've never seen such chops in two short hours. It's good to see Summer Shorts revitalized. The fun is back. Thanks, John Manzelli and Antonio Amadeo. Over the years, Summer Shorts has drawn some of the region’s best performers, those who are game for the marathon, multi-character, quick-change experience. Not back this year is Steve Trovillion, who often dominated the theatrical event with his anything-goes comic abandon. He is missed, although his shoes are filled quite well by Ken Clement and Todd Allen Durkin, a pair of capable clowns who manage to elevate the material they deliver beyond what is on the written page. 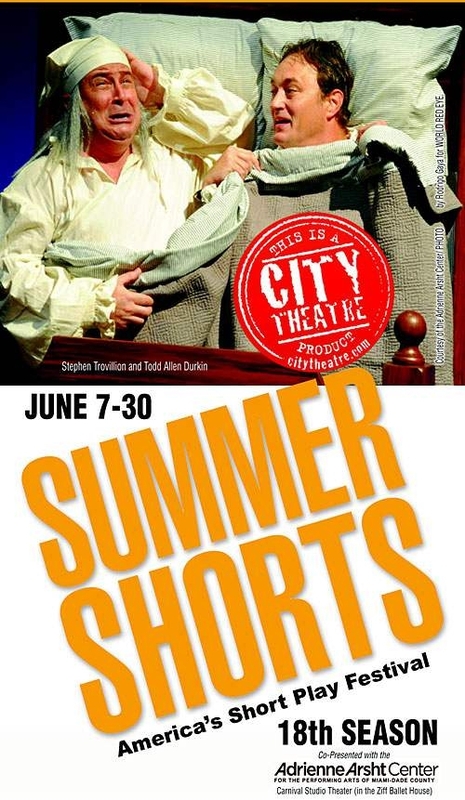 City Theatre presents Summer Shorts at the Arsht Center through June 30, 2013. Ken Davenport talks about changes happening at gmail and what that will mean for the ubiquitous email blast. We don't often think about the impact our art has on the environment. Jeremy Pickard has a great article at TCG on creating sustainable theatre. On one hand, I do not wish to preach, for who am I to tell fellow artists what the content of their plays should be, or that it is their duty to recycle building materials? Other than encourage, all I can do is my work. But I also want to be as effective as possible, and theater artists who actively practice sustainability are the extreme minority. It occurs to me that if I actually care about making an impact on the world, I can’t be the only one doing it. Meanwhile, there's a campaign to keep traditional lighting instruments, citing the economic issues for small companies of purchasing of more efficient instruments. Chris Croslan writes on how he left his arts administration job to become an independent artist. I'm more interested in what's not being said in this article than what is being said. There's such a divide between artists and arts administrators, even though most of the later are the former. And yet, there's a big push for our administrators to be administrators, not both a practicing artist and an administrator. Tomorrow's Weekly Howl on twitter is going to be on creating a career in the arts and what that looks like. HowlRound has an interview with Carlos Murillo, one of the most insightful teachers I've ever had. I'm eight years out of my BFA and just a few months ago, I had an "aha!" moment about something that came up in class a decade ago. Why are skinny white girls the main representation of femininity on stage? Melissa Hillman's blog on the lack of diversity of feminine experience on stage. All women everywhere are expected to see ourselves, find our humanity, and relate our experiences to the experiences of skinny white girls, most of whom (let’s be realistic) are under the age of 40. AND WE DO. We do it all the time. We do it so well we don’t even think about it most of the time. This is a learned skill. You have to TRY to do it if you don’t already know how. It has to be a conscious choice to step over your privilege and learn to translate the experiences of people who do not share your privilege, finding your own humanity within them. Once again, this Monday isn't actually all that dark, because it's SUMMER THEATRE FEST! 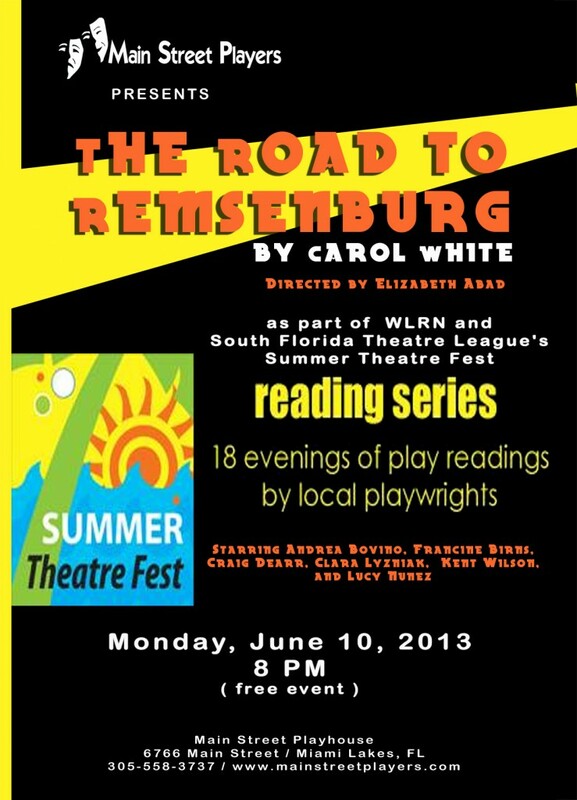 This week, Main Street Players participates in the South Florida Theatre League's new play reading series with tonight's staged reading of The Road To Remsenburg, by Carol White. Main Street Players is a community theater company that operates a small space in Miami Lakes, aptly named The Main Street Playhouse. 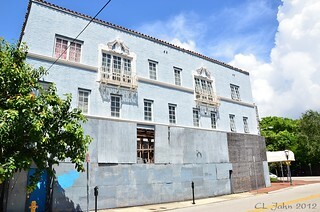 That space is also serves as the primary venue for The Alliance Theatre Lab, a professional non-Equity theatre company. Last week's reading at the Broward Center was a great success, and we hope that trend continues. If you're looking to Get In Bed With The Arts, you'll have your opportunity this Thursday at GableStage. And you still have a chance to enjoy a free night of theater in July. The Miami Herald reports that GableStage will be staging a reading of Richard Janaro's Evicted tonight, a fresh take on Shakespeare's King Lear. The same article also mentions that south Florida playwrightt Mario Diament's A Report on the Banality of Love is being stage in Paris, France. (Yes, it's been translated into French.) The play premiered at the defunct Promethean Theatre Company back in 2009. Florida Theater On Stage reports that Palm Beach Dramaworks and The Theatre at Arts Garage will be staging "concert versions" of musicals. Dramaworks will be staging some familiar shows from the American musical canon, but predictably, Louis Tyrrell at Arts Garage will be staging new works. Broadway World reports that Parade Productions is staging a reading of a new play by Michael Leeds. The Gift will be performed on July 1 at The Studio at Mizner Park Cultural Arts Center. In case you've been thinking that theaters going dark is a south Florida phenomena, The New York Times reports that there's an unusually high number of vacancies on Broadway right now. 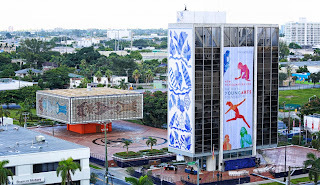 miamiartzine had a photographer at the Arsht Center for the opening of City Theater's Summer Shorts. The Minnesota Playlist takes a look at how a few of the 70 theater companies in Minneapolis are using social media to their advantage. Actually, Mondays this summer won't be dark; tonight the South Florida Theatre League launches its Stages of the Sun, a series of readings of plays written by playwrights who are members of the South Florida Theatre League. The series is part of this year's Summer Theatre Fest, sponsored by the League and WLRN. Tonight's reading is being held at the Broward Center for the Performing Arts' intimate Abdo New River Room; you may know it as the home of Laffing Matterz. And that's a photo of the room set for theater-style seating. We hope to see you there! Florida Theater On Stage has the skinny on what's being read on South Florida stages on upcoming Mondays. Florida Theater On Stage reports on Jan McArt's next venture (which you've already missed), and Gablestage's staged reading of Holocaust: A Living Journey-Book (which you haven't.). Palm Beach Daily News reports that Palm Beach Dramaworks will be doing a concert version of The Man of La Mancha. The theater’s first concert-style musical — a sold-out Camelot in January — paved the way for the summer series. Once again, the show will be presented with minimal staging and design and a spare accompaniment. The band will feature a piano, guitar and percussion. 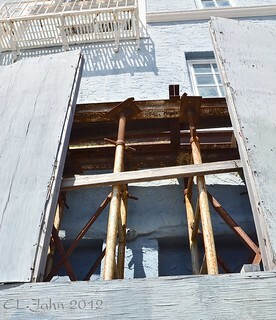 The theater also plans to mount a second concert-style musical later in summer. It's unlikely that the company will produce these large shows as a full production; like the Caldwell, this is a way to deliver this kind of programming despite a lack of resources (mostly space). So don't wait for later. The Drama Queen reports that Actors' Playhouse has finally announced its complete line-up of shows for next season; Ruthless, The Musical; Making God Laugh; End of the Rainbow; Spamalot; Scott and Hem in the Garden of Allah, and Mid-Life 2 (The Crisis Continues). And yes, that last is the sequel to Mid-Life; The Crisis Musical. She gives us the run-down on each one. Florida Theater On Stage interviews Ricky J. Martinez, artistic director of New Theatre. This isn't the first time Cherilynn Marrocco has been featured in the news.This time, The Miami Herald visits her at the Little Haiti Cultural Center, where she's working with her MAD Dance, a company she founded in 2011. The program now serves about 120 kids from Miami-Dade and Broward, with classes seven days a week, which have been full almost since the beginning. On a recent evening, groups of giggling dancers filled the center’s lobby — some of the older ones with muscular physiques, reflecting years of training, while others clearly still developing. Broadway World reports that the National Young Arts Foundation has put its application form online for this next year. For 33 years, YoungArts has been identifying and supporting the next generation of artists, and contributing to the cultural vitality of the nation by investing in the artistic development of talented young people. By providing 15- to 18-year-old artists with life-changing experiences with renowned mentors, access to significant scholarships, national recognition, and other opportunities throughout their careers, YoungArts helps ensure that the nation's most outstanding emerging artists are encouraged to pursue careers in the arts. It’s great to have a lot of options, but the sheer volume of local theater can be overwhelming to even the most avid art lover. Every week we give representatives from two local productions a chance to tell us why their show should be at the top of your list. Leave a comment below, and let us know if you'd like to see The Scene start a similar program. Butts In Seats reflects on how the professional theatre community regards community theatre.